Tracey was enjoying a peaceful lunch with a group of friends when suddenly one of them chose to unleash a five-minute rant on the state of the economy. In complete disagreement with everything she was hearing, she started to feel a slight sense of emotional discomfort and began to formulate a list of reasons why her friend was wrong. As soon as the rant was over, Tracey chose to insert her rightness into the conversation in an effort to set her friend straight. What ensued was a competitive match of verbal Ping-Pong, which ultimately ended in a draw. When she returned to her workplace, Tracey realized that the residual anger was still very present and that it was increasingly difficult to focus on her work. What started as a wonderful day full of positive emotions had now transformed into a day of mental distress. Can you relate to Tracey’s story? Have you ever chosen to partake in an argument for the sake of proving the other person wrong, only to end up with heightened levels of frustration and anger? 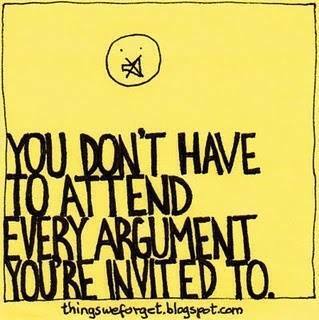 As you know, arguments rarely end up in a win-win fashion. The biggest reason for this is the presence of strong emotions which greatly influence our tone of voice and delivery. What we fail to realize; however, is that these emotions are a direct result of our thinking. In the example above, Tracey was more than likely thinking – Oh, she is so wrong. I can’t believe she is saying this. The nature of these thoughts led to feelings of aggression, which then influenced her tone and delivery when responding to her friend. It’s likely that Tracey would attribute her anger to the friend for starting the argument, thus feeling justified for this unwanted emotion. In other words, her friend was the one who ruined her day. Now imagine that Tracey was back at lunch with that same group of friends the very next day. Within minutes, another rant ensues, this time it’s about the unfair nature of the company’s salary structure. Once again, Tracey starts to formulate her response in her head, ready to go mano-a-mano for the second day in a row. This time; however, she replaces her aggressive thoughts with an entirely new way of thinking. Instead of taking the I’m right, she’s wrong approach, she decides to use her curious/creative lens and says to herself – I wonder why she thinks this way? Maybe she received a less than stellar performance review and this is her way of venting. Unlike the feelings of anger and frustration from the day before, she now feels peaceful and content. She returns to work and has a very productive day. What was the primary difference between the two scenarios? Every argument begins with an indirect invitation to partake in the festivities. In the first scenario, Tracey gladly accepted the invitation to argue and as a result ended up with unwelcome emotions. In the second scenario, armed with an awareness of her thoughts, she chose to be curious and ultimately declined the invitation to argue. The next time you find yourself ready to play verbal Ping-Pong, consider the following question – Is it worth accepting this invitation?